We're excited to have access to a special series of blog posts coming up written by by John Cornish, Speaker at the 2017 Dallas Mineral Collecting Symposium, while on-site working the Adelaide mine extracting crocoites. It’s 9:28 pm. It’s been a long day. As usual, we arrived at the mine at 9:30 this morning. Uncharacteristically, we worked late tonight, until 7:00 pm (our typical quitting time is around 5:00). At this point, now, Bruce has come and gone and I’ve finished showering and have eaten dinner. After finishing here, I’ll watch a movie or something to kill the time before finally I’ll call it quits and will head off to bed. This morning, on the way in, I spooked two black cockatoos from one of the trees along the old Dundas road. These are large birds, beautiful, loud and entertaining. Very much I enjoyed watching them a’ wing, as for a moment, they flew just ahead of the car before arcing away and disappearing among the greenery. After that and almost at the mine, I spotted one of the two Wallaby’s I’d see today, one on the way in and the other, while driving out this evening. After talking things through this morning, we both headed underground, Bruce and I, and took some photos and fine-tuned our work plan. When finished, I took the lead and began work on what would become a spectacular 20 inch long by 15 inch wide plate of glowing orange crocoite, one from down-low on the far-side of the “Refrigerator Rock”. First, I cleared a slot between Mother-Tasmania and my hoped for specimen, on the specimen’s left hand or its Foot-Wall side. While doing this, I recovered a flat-and-a-half worth of mediocre specimens. With that completed, next I whittled and cut, pried and sawed two lines, one vertically along the Hanging-Wall at a point suggested by Bruce (to minimize the damage where the plate would separate when collected), and the other, a horizontal line across the “top” of the specimen where I hoped to separate and liberate the plate from the mountain. The “top” here is a kind of false identification. For this specimen, even at 20 by 15 inches, it could have been much larger, why it wasn’t would be due to the intimate contact shared between the matrix “Refrigerator Rock” and the hanging, overhead “Death Rock” precariously positioned against it. By limiting the plate’s size, I’d be able to extract the part of the crocoite exposed below this critical contact point so as to leave everything there attached, in-place, and me happy and safe! This was my goal; this is what I set out to do. Like the last big plate we recovered, I’d have to wedge myself in under the plate to support it when it broke free with the force exerted by Bruce’s bar action. To do this, I created a raised platform for me to sit on, bringing me in close and snuggled in tight. Once positioned, I directed Bruce to drive the bar into a solid area I’d noted, to securely lever against. He plunged the bar in forcefully, finding a solid purchase point, and there began his downward levering action. With very little to-do or fanfare, it wasn’t long before the rock gave way under Bruce’s exertions and the crystal covered mass I’d set my sights on broke free and dropped gently into my waiting arms. Bruce was right there to help once I’d taken on the weight, to help pull me back, allowing me the impetus to bring the specimen around to a safe position where it could be set down securely. Hearts pumping, smiles twinkling in our headlamp’s glow, we’d done it, another flawless extraction… Yes! With photos taken, it was time to bring our big new prize out from the pocket-zone and the underground. The easiest way to do this, load it into the wheelbarrow and roll it out slick-as-slick-can-be! Outside, we took more pictures. Satisfying.... Fun... Productive… Successful… Yay!!! Exhilarated and buoyant, riding the wave, after, we broke for lunch. With this plate removed, the area we were working opened dramatically, revealing the position of the “Death Rock” to better advantage and also exposing an exceptional crocoite plate awaiting extraction, currently at rest upon the Hanging-Wall. This would be our next area of focused recovery. With lunch over, Bruce and I headed back into the mine to assess the best way to extract the Hanging-Wall plate. We both took our time and shared our best most insightful thoughts and then, that done, I set to work (Bruce was kind, offering me the lead). I had a tiny bit of rock I wanted to remove prior to working towards the plate, well over a foot away from the closest crystals. To do this, I started up the generator and powered up the hammer. Ready, I set the hammer to the stone and seconds later, before the rock I was working even had a chance to crack, the entire plate, that exquisite beautiful perfect plate covered in glowing orange crystal perfection on the pocket’s Hanging-Wall fell, dropping like a stone, down to the ground below where all of its crystals crushed in a broken heart’s beat. Stunned, the hammer still rattling in my hands, I just sat there and stared, incredulous and dismayed. After a time, I shook my lethargy and switched off the hammer. Like picking up broken babies, I gently lifted the crushed specimens from the dirt and hauled them outside to show Bruce. He was as blown-away as I was, neither of us saw this coming, even though the Hanging-Wall has a history in this pocket of producing specimens lightly and precariously attached to its surface, this plate looked sooooo secure. Disappointed, saddened almost to the point of tears, I took a break from collecting. Quietly, solemnly, Bruce took up the tools after. 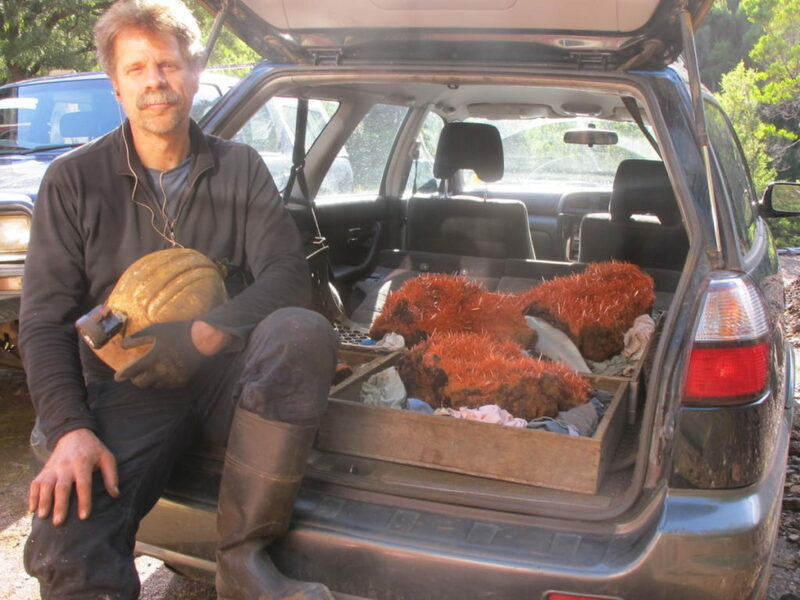 Bruce recovered nearly two flats worth of specimens before we called it quits for the day, collecting them from the underside of the Death Rock. By collecting these now, we’ll have a chance to produce, while staying out of harm’s way, many lovely specimens, unless of course the rock drops (which it appears likely to do at any moment it is so precariously and dangerously hanging). And so, a little less enthusiastically than I’d hoped, our day finally came to an end. In the darkness illuminated by our headlamps we puttered about and gathered up our gear and then closed and locked the doors and set our sights for Zeehan. The crystals affixed to the “Death Rock” will be there waiting for us in the morning (or they wouldn’t), for now, it’s been a long day. 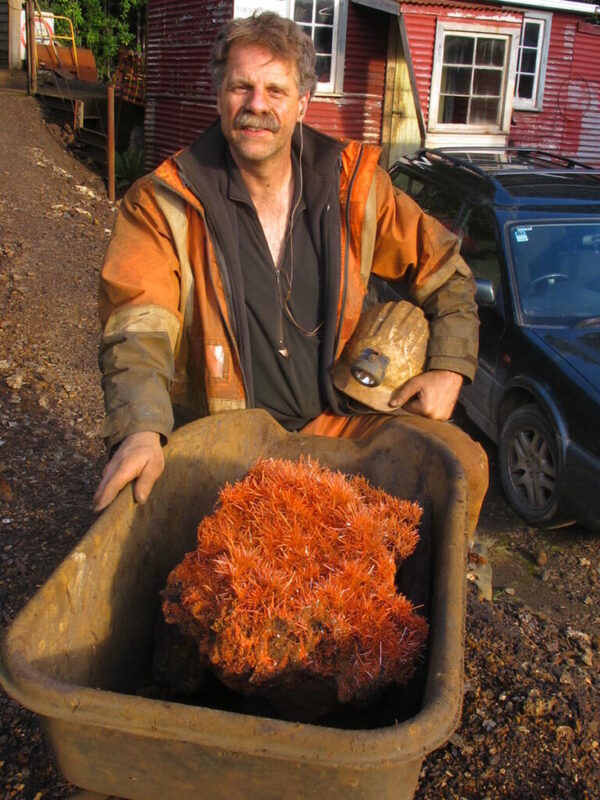 This trunk-full of orange crocoite is only a small amount of the treasure collected by John and Bruce. Photo courtesy of John Cornish. Love what you read? Join us later this summer for the Dallas Mineral Collecting Symposium to hear John tell his stories in person, or start reading from Part 1 of his e-mail records!